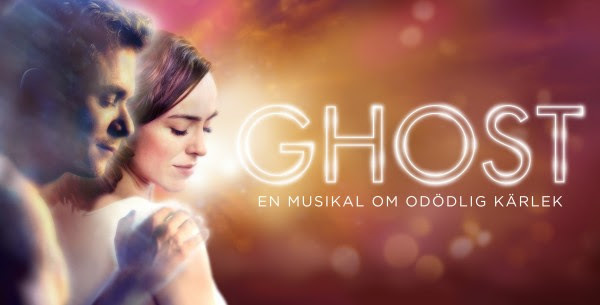 Something to Muse About: GHOST - The Musical about Immortal Love coming to China Teatern in the Fall! GHOST - The Musical about Immortal Love coming to China Teatern in the Fall! GHOST - the romantic film with Patrick Swayze and Demi Moore in the lead roles came in 1990, both the story and Whoopi Goldberg were rewarded with an Oscar. Based on the successful movie, created the musical of the same name and after the premiere of the British Manchester Opera House in March 2011, it soon became renowned as one of today's most touching love stories. The musical has been a great success both on Broadway and West End and now we finally get the chance to experience GHOST live at the China Theater in Stockholm. GHOST is about the New York couple Molly and Sam are living a happy life together. After a dramatic event suddenly change everything and Sam, stuck between two worlds face a task in which he was using a medium Oda Mae, must find a way to protect Molly. GHOST leave no one indifferent and musical audience can take part in a tale of sorrow, happiness, mystery and immortal love. Lead actors are handpicked and are some of the vocal and musical scene's brightest stars. "Sam Wheat" played by the multifaceted singer Peter Johansson, who made innumerable major roles in musicals. He has played the "Judas" in Jesus Christ Superstar, "Stacee Jaxx" Rock of Ages, "Tommy DeVito" Jersey Boys "Galileo" in the musical We Will Rock You in the West End of London. We see the Danish musical star Maria Lucia Heiberg Rosenberg "Molly Jensen." Her theatrical and musical career started at a young age and now she stands at the very top of Denmark's musical artists. She is now making her first musical production in Sweden and learn right now Swedish right of this participation. The eccentric medium "Oda Mae Brown" played by singer and pop artist Gladys del Pilar Bergh who constantly appears in many different contexts as well nationally and internationally. In his role as Carl Bruner we see the musical star Bruno Mitsogiannis which in recent years appeared in several major musikalers main roles such as "Galileo" in the Queen musical We Will Rock You at Cirkus in Stockholm and "Frankie Valli" in the musical Jersey Boys at the China Theater. It was during the rehearsals of hard rock musical Rock of Ages, which Ostgota Peter and Bruno found each other both as friends and musicians. Since then, they have made several appearances together as a duo, including the television show How's the spirit in which they competed together three years in a row. In China Theater has previously made his own show "Peter and Bruno - live China" and the musicals Jersey Boys and Rock of Ages together and it is therefore particularly gratifying to have them back on the same stage again. China Theater tradition of films that become musical lives on and with success-like Dirty Dancing and Flashdance in the back, we get a hint of autumn's great musical GHOST. It is director Anders Albienand choreographer Jennie Widegren who was the creative force behind Flashdance and now once again create an extraordinary experience for the musical audience. Musical GHOST has previously been recognized for its visual expression, and that is now the creative team reflect upon, among other things, with the help of natural persons as part of the set design and special effects. "As always with all really good entertainment so we need a good story basically. GHOST has a great love story like no other, a story about how the love of another human being lives on in us even in the afterlife, "explains director Anders Albien. Glen Ballard, among other things, is behind the hits "Jagged Little Pill" and "Man in the Mirror" Together with Dave Stewart from Eurythmics pop group, wrote the music for the GHOST. With the song Unchained Melody from the film's iconic drej-scene basis, the music producers Stewart and Ballard have created a collection of newly composed great songs that play on the emotional strings that the touching story.